December 6, 2014. Istanbul, Turkey. (ONN) The Green Party is arguably the second largest political party in the world with active affiliates in countries across the globe. And thanks to a slew of recent election victories in a number of countries, as well as a passionate fight for Scottish independence, the Party has nearly doubled its worldwide membership in less than a year. From Taiwan to the UK and from Denmark to Croatia, the Green Party is a force to be reckoned with. Natalie Bennett, former Guardian Editor and current Chair of the Green Party of England & Wales. The UK Greens have doubled in size in less than a year. Image courtesy of PoliticsHome.com. Headlines over the past few weeks show the international Green Party has not only continued its decade-long growth spurt and string of election victories, but has accelerated it, doubling the Party’s membership numbers in a host of countries just over the past year. The most recent example comes from Taiwan, or Chinese Taipei for those who don’t believe in self-determination. One week ago, Green Party candidates won elections for the first time since the Party was organized there in 1996. 25-year-old Wang Hao-yu won a seat in the Taoyuan City Council. And 34-year-old Jay Chou was victorious in a bid for a Hsinchu County Council seat. “In the next four years, Green Party representatives will serve as civil society’s window into Taoyuan and Hsinchu councils and maintain responsibility to all citizens,” Focus Taiwan News quoted a statement from the Taiwan Green Party immediately after last week’s surprise election victories. The Green Party of England and Wales demonstrates that, as opposition political parties, our situation and experiences are the same in every country. It’ shouldn’t be a surprise considering the ‘establishment’ in most countries is made up of the exact same individual globalists that control government and business the world over. As the opposition, if our adversaries are the exact same people, it shouldn’t be a surprise that our battles, tactics and predicaments are the same the world over as well. The UK’s Green Party showed us what can happen when the establishment excludes political parties from election debates and important national referendums. In a report from The Guardian four days ago, the publication states that due to the highly publicized debate over Scottish independence in September, the Green Party across Britain grew by 50 percent just in the two months surrounding the unsuccessful ballot initiative. The publication cites two main factors for the UK Green Party’s explosion in membership. First is the fact that the Party was systematically excluded from the political process over Scottish independence, including the nationally televised debates. The snub either fueled local members to step up their efforts or created sympathy among voters, or both. 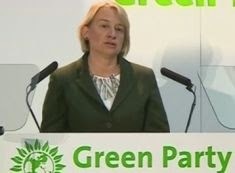 The second factor mentioned is the “strong” performance made by Green Party national leader Natalie Bennett on a nationwide radio show at the time. Showing that the recent rapid growth of the Green Party isn’t limited to just a couple countries like Taiwan, England and Scotland, an international conference of Green Parties took place last month in Istanbul, Turkey. There, the Party’s explosive increase in international membership was evidenced by the addition of two more countries into the Green Party family of global Greens. Denmark’s Green Party is led by Pia Olsen Dyhr and is already a powerful political force in the country. The Green Party there was actually a part of the Danish government from 2011-2013. The Croatian Greens were founded last year by Mirela Holy and have seen instant success with the election of one of its members to office in their first year. The European Greens note that the Green Party in Croatia is already the second largest political party in that country. For its part, the Green Party of the United States elected 27 of its candidates to office in elections last month. It also increased the number of states it has ‘major party’ status in, including New York where a four-fold increase in votes for their Gubernatorial candidate over 2010 boosted the Green Party of NY to the third largest political party in the state. For more information, read the Opposition News article, ‘Greens win 27 Election Day races’. Or visit the Green Party USA at GP.org.